The Springfield Parking Authority invites sealed bids for the Repair and Preventative Maintenance of the Columbus Center Parking Garage, One E. Columbus Avenue, Springfield, MA 01103, in accordance with Contract Documents prepared by DESMAN Associates, 18 Tremont Street – Suite 300, Boston, MA 02108. The work of this contract includes concrete, waterproofing, masonry and painting, repairs and/or replacement. Sealed bids for the General Contract on forms furnished by the Springfield Parking Authority will be received at the office of the Springfield Parking Authority, 150 Bridge Street, Springfield, MA 01103 until 2:00 PM local time (EST) on Thursday, November 2nd, 2017. All General Bids will be publicly opened and read aloud immediately thereafter. Sealed sub-bids for the trades listed herein on forms furnished by the Springfield Parking Authority will be received at the office of the Springfield Parking Authority, 150 Bridge Street, Springfield, MA 01103 until 2:00 PM local time (EST) on Thursday, October 19th, 2017. All Filed Sub-Bids will be publicly opened and read aloud immediately thereafter. Each General Bidder must be certified by the Department of Capital Asset Management (DCAM) for the category of work and dollar amount of this project and to be considered must submit with his or her Bid, a DCAM Certification and Update Statement indicating additional work or contracts performed or executed after the certification date. The category of work for this Project is General Contracting. The estimated construction cost of this project is $700,000. Each Filed Sub-Bidder must be certified by DCAM showing that the Sub-Bidder has been certified in their particular sub-bid category to participate on public construction projects and to perform the work required for a sub-bid to be considered. A DCAM Certification and Update Statement indicating additional work or contracts performed or executed after the certification date must be submitted. Each General Bidder and each Sub-Bidder may obtain complete sets of the Bidding Documents, including Bid Forms, after 2:00 PM local time (EST), on Wednesday, October 11th, 2017, at the Springfield Parking Authority website: https://springfieldparkingauthority.com/bids/ . Copies of Addenda will be emailed to registered bidders without charge. A Pre-Bid Conference will be held on-site at 10:00 AM (est) on Friday, October 13th, 2017. All prospective bidders are strongly encouraged to attend this walk-through and meeting. Filed Sub-Bids are required for the following trades: Waterproofing, Dampproofing and Caulking, Masonry Work and Plumbing. Each General Bid and filed Sub-Bid shall be accompanied by Bid Security equal to five (5%) percent of the Bid amount in the form of a Bid Bond, Certified Treasurer’s or Cashier’s Check, issued by a responsible U.S. bank or Trust Company, payable to the Springfield Parking Authority. Each Bidder shall attach required Bid Bond or Check to the Bid Form. The Bid Securities of all General Bidders, except those of the three lowest, responsible and eligible General Bidders, will be returned within five (5) business days, after the opening of the General Bids. The Bid Securities of all Filed Sub-Bidders, except those of the Sub-Bidders named in the General Bids of the three lowest, responsible and eligible General Bidders, and those of the three lowest responsible and eligible Sub-Bidders for each sub-trade, will be returned within five (5) business days, after the opening of General Bids. 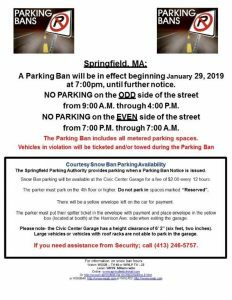 The Springfield Parking Authority reserves the right to waive any informalities and to reject any or all General Bids not deemed to the in the best interest of the Authority. The Authority reserves the right to reject any Filed Sub-Bids if it determines that such Sub-Bid does not represent the Sub-Bid of a person competent to perform the work as specified or that less than three (3) such bids were received. (Ch. 149, Sec. 44E). All bids for this Project are subject to the provisions of Massachusetts General Laws (Ter. Ed. ), including without limitation, Chapter 30, Section 39M as amended; Masss. G.L. Chapter 149, Sections 44A through 44L inclusive; and Chapter 149, Section 26 through 27D inclusive. Attention is directed to the fact that no less than the minimum wages set forth in the Contract Documents must be paid on this Project and that no Sales Tax should be included in the bid. as hiring locally, in all contracts. Please click here to request an electronic copy of this IFB. The Springfield Parking Authority (SPA) is soliciting proposals from qualified professional firms for the production of two parking need assessment studies for the areas known as the Worthington / Dwight Street Entertainment/Dining District (Phase I) and the STCC / State Street Corridor (Phase II). The Request for Proposals (RFP) will be issued beginning February 1st, 2017, and will be made available electronically to interested parties who submit requests via email to the contact person at the address listed above. Responses are due on February 27, 2017, at 2:00 p.m. in the SPA Office, 150 Bridge Street, Springfield MA 01103-1417. An award will be made within 30 days and contract negotiations may begin at that time with the Proposer offering the most advantageous proposal. Specifications and required forms are available on the SPA website at www.Springfieldparkingauthority.com. There will not be a public opening. All responses must be received in accordance with the requirements set forth in the RFP, prior to the deadline. The Springfield Parking Authority is seeking qualified applicants for the position of a part-time Parking Operations Assistant. The Parking Operations Assistant will perform a variety of responsible, professional administrative and analytical functions, initially 20 to 25 hours weekly. A copy of the job description can be obtained by clicking here. Resumes may be submitted electronically via email to NDuquette@SpringfieldParkingAuthority.com, or by mail to the Springfield Parking Authority by August 18, 2016. The Springfield Parking Authority (SPA) is soliciting proposals from interested parties for the disposition, by lease, of the City Stage Theater located at One Columbus Center, 150 Bridge Street, Springfield, MA 01103. The CityStage Theater is a multi-story building with 40,000+/- square feet of gross building area, with one theater with a stage and seating capacity of 475, a smaller theater with a stage and seating capacity of 87, a rehearsal hall, office space and dressing rooms/showering facilities. The CityStage Theater consists of a single parcel, with adjacent paid parking. CityStage has a business address at One Columbus Center and is located on the corners of East Columbus Avenue, Worthington and Bridge Streets. As-built plans for the CityStage Theater are available for inspection at the Springfield Parking Authority, 150 Bridge Street, Springfield, Massachusetts 01103, Telephone No. (413) 787-6118. This solicitation is being conducted in accordance with the provisions of Massachusetts General Laws Chapter 30B, Section 16 and all lease documents must be strictly awarded in accordance with the requirements of the Request for Proposals regarding Real Property Transactions. If it becomes necessary to revise any part of this RFP or otherwise provide additional information, an addendum will be issued to all prospective proposers who received copies of the original request. Proposals are due on June 20th, 2016, at 2:00 PM, in the SPA Office, 150 Bridge Street, Springfield MA 01103-1417. 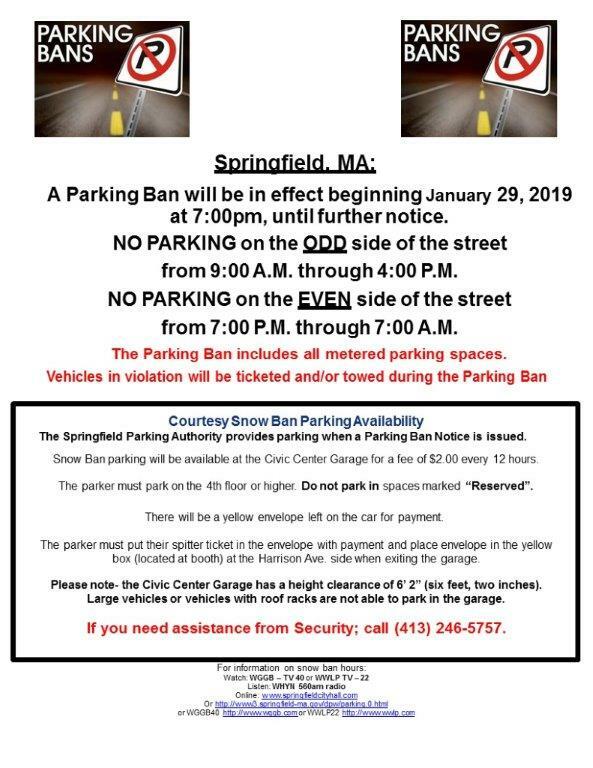 An award will be made within 30 days to the most advantageous proposer, and Lease Agreement must be executed with the Authority within 45 days from the date the winning proposer is notified in writing that its proposal was accepted by the Springfield Parking Authority Board of Directors. Specifications and required forms are available on the Springfield Parking Authority website at www.springfieldparkingauthority.com. Proposals will be opened in the Parking Authority Office at 2:00 PM on the date due by the Chief Procurement Officer. The opening of the bids is public. All bids must be received in sealed envelopes properly marked prior to the deadline. Please click here to request an electronic copy of the RFP.